Love is a ceaseless subject and as long as humans are alive and the concept of love manifests in movies in some form, the same form or other. Recent Malayalam money spinner ‘Premam’ distinguishes itself with several special aspects. It is just the second movie of writer director Alphonse Putharen and most of the players are new faces and not big stars. One cannot dismiss ‘Premam’ as just another love story. It is set on several growing stages of a boy from 17 to 30. George David (Nivin Pauly) never tired of falling in love. The calf love starts during his pre degree days. So he chases Mary (Anupama Parameshwaran) with his gang of Koya and Shambu (but, why they don’t fall in love, well, they are sidekicks and not hero!). But, after a few futile escapades, George realises that Mary is love with some other George. After joining college, his disposition turns hirsute with a big beard and rough look and indulges most of the time rebellious indulging in fisticuffs and verbal duals. Malar (Sai Palavi) enters as a computer lecturer but charms George. She is a bindaas girl who can shock George into a wolf whistle break dance and can wear jasmine flowers with coy look and visit the temple. She also responds to George’s overtures. But, on her return to native Kodaikkanal, she meets with an accident and goes into memory loss. She is unable to recognize George when he visits her. A heartbroken but matured and good looking George becomes the owner of Café Agade. Here another charming young colleen appears and she says she knows him. She is Celine (Madonna Sebastian) the younger accompanying junior of Mary in the school. George’s broken heart finds a fillip on seeing this girl again. Here also he faces defeat and what happens to the love stricken and always broken George in the end? While seeing such movies, one cannot but help the feeling that a growing male and his friends have nothing else in the world except to talk about girls and falling in love? Probably, the present generation which is more pampered, comfortable, affluent, outgoing and open minded has hardly anything but to fall in love ad nauseum. 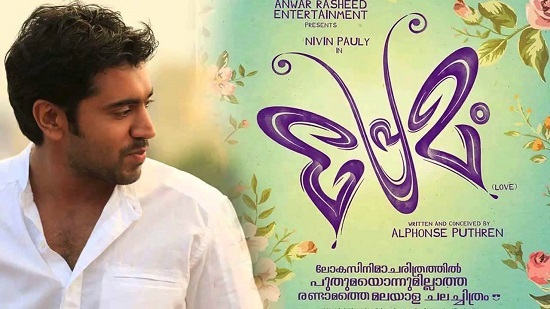 Nivin Pauly charms the viewers with his effortless performance and earthy looks. The others, most of them newcomers perform without inhibitions because they have not much of a drama to enact except to repeat what they do exactly in real life. The comedy is absolutely immature. The critics today are also too generous and nice towards new film makers and their products notwithstanding the drawbacks. ‘Premam’, in my view, is just another frivolous love story; the reason for its stupendous box- office success? Search me.